Morgen folgt übrigens die deutsche Version! JW: Hello! Johannes here from Cologne, Germany! Jon Favreau: Hi Johannes! Nice to meet you. This is Jon. JW: It is a great pleasure for me to be able to speak to you today. Jon Favreau: Very kind! Very nice of you! Yes, I am a little bit nervous on this call, I gotta tell you. Jon Favreau: Well, in preparation for the Jungle Book I met with people from all around the world and it seems that Germany is the one region where they have the most affection for the 1967 film. So, when I made this movie I was thinking a lot about this phone call when I was gonna talk to somebody who had seen the movie who is from Germany, because I felt the most pressure to make sure that I honored the old one and made sure that even so I did things differently here it still felt like as in keeping with the tradition of the old one, that the audience in Germany has grown to love so much over the years..
JW: Yes, I am not only very fond of the Disney movie from ´67, one of the very first film I saw in the cinemas as a little child, but I also love the old Alexander Korda movie from ´42, which I saw on television many times. Jon Favreau: Yes, the one with Sabu! JW: Yes indeed. So I was very anxious to see your new movie and I have to say: Great Job! Congratulations! This is absolutely amazing! Jon Favreau: So you feel like the people who grew up with the old movie, loving it so much, feel like you do, that it feels like it connects enough to the old movie for the German audience ? JW: Yes indeed, very much, absolutely! But this must have been very tough for you, being aware that there is the old Disney classic or the old british movie with its hilarious plastic crocodile- it must have been very tough for you, to find your own voice, your own tone for the new movie? Jon Favreau: I enjoyed it, because it is a bit of a puzzle. I welcome it, it is not something that frightens me, but it is something, that when you are done with it and you do everything that you think it is right, you do care what people think, you hope that your instincts are lining up with your audiences instincts because you can only make one person happy when you are working on it and that is really yourself. And you hope that in making yourself happy that translates to the rest of the world. And I, like you, I grew up with it, I was born in 1966, so that was one of the first movies I ever saw, I saw it over and over again!!! I loved the music, I loved the characters. But there was a bit of a balancing act, because the head of the Studio, Alan Horn, he grew up with the Kipling stories. 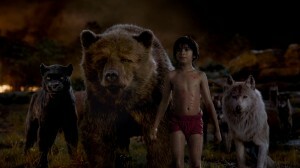 And when I came on board, this movie resembled the Kipling stories much more then the Disney version. I think they were using …, they have been making live action versions of their old movies to a very good effect for the last few years, and so that was a new property that they were seeing in the line of live action films and I think that their instinct was to make it quite a bit older and there was no music in it and to me it felt like we are missing an opportunity when I got hired because the music was important and the characters and the humor were important and we knew we could do a g-rated kid´s movie or kid´s musical like the original was. But I then felt there was a way with the photorealistic animals to bring something, a tone that felt in line with the tradition of Disney but was a bit more intense then the children´s cartoon and so we looked at movies like the Lion King which I think balance music and scariness and the idea that characters could die which I don´t think was part of the 67 film, but it was very much part of the big five, Snowwhite and Bambi, Pinocchio, Fantasia and Dumbo, those are kind of the five classic Disney films and those had variations and tones where you had music, and you had humor but you also had very scary villains. Walt Disney was not afraid to scare the audience. He felt that it was actually part of having a very full experience. 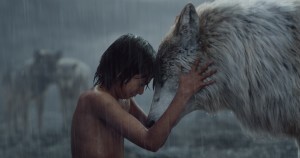 But you also doing that with a film with a movie called Jungle Book and most people´s memories are what you described and fortunately with the marketing material the people are getting a sense what this movie is. So they are walking to the cinemas understanding and certainly the youngest children are going to be probably be scared by it. But the trade off is, you get a movie that is geared towards the entire audience much in keeping with the tradition of Walt Disney´s earlier work. JW: It is a tricky thing making a photo-real movie. Even rain or death get real too! Jon Favreau: Yes, that is why we needed to do things like keep the violence off screen. Because if you see your animals fighting each other, if you show that too graphically, this would be just too much for this movie. So we have what we call the PG-rating in the United States, means any age can go but parents should pay attention and know, if their child is too young to see it, if it is too intense. You see, I think 3D also contributes to this! The 3D is adding to this effect. 3D, Imax, it is loud and big and the animals sounds and all that. It can be very overwhelming, some of the sequences can be very overwhelming That has been the balancing act here. But I have to say for me personally I it does feel like there is a lot of impact that it has cinematically by being photoreal. And so I do not think there was no real way to use that technology and these techniques and these designs to do a direct adaptation of the ´67 film. I think that would have been very weird. Because the characters were very cartoony and anthropomorphic and human and it won´t have worked with the photoreal animals. I think It would have felt strange. So this is the balance that worked for me and fortunately people seem to responding well to it. They are certainly curious about it. But I am waiting to see what happens when the film comes out. I can´t wait to see what the reactions of the audiences will be. JW: I am pretty sure, that this will be a huge hit and there will be a part two! I hope, there will be a part two. But I would love to speak about the songs – you kept three of the ´67 movie in your film. Jon Favreau: Yes, I felt, that those songs were a very big part of what I remembered and loved about the film. Idid not want to keep all the songs I did not want to make it a musical. If you put too many songs in it, it becomes a musical and the tone shifts! And I think that the sense of danger is an important part of it and I looked to the old Disney movies to see how they combine music with the intense moments and they used a formula that was also used in westerns. It was a more popular structure back in the earlier days of American cinema which is you use it almost like a set piece like you would use a comic set piece or anything, you take a moment outside the movie to have a song. And I felt that I had to include at least those two songs and “I wanna be like you!” and “The Bare Necessities”. But I had to rework them a bit to fit into my story. ”Bare Necessities” fit in quite pretty well. But “I wanna be like you” I had to treat differently and we had to change the lyrics. Fortunately Richard Sherman, who wrote the song originally with his brother is still alive and working and he wrote some new lyrics for us to match our version of King Louie. And then “Trust in me” happens in the end credits that Scarlet Johansen sings. So that did feel like the footprints of the old movie and every other musical reference we work in through the score. 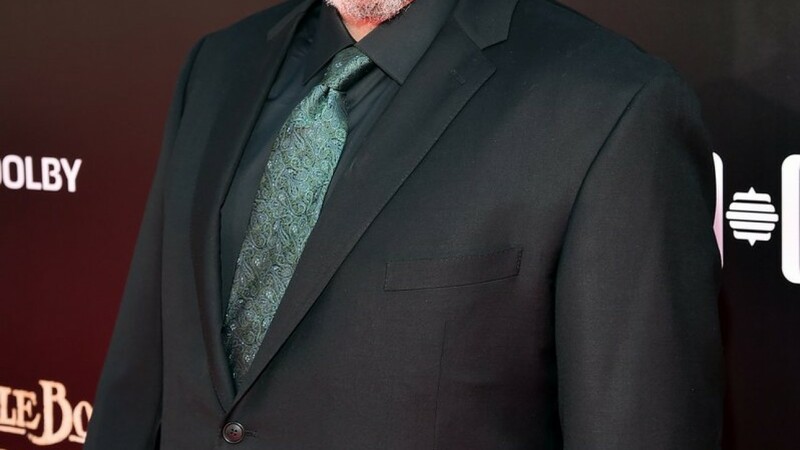 John Debney, who is our composer who grew up on the Disney lot actually with Walt -when he was young his father worked on movies as early like Snowwhite , so he was around, his childhood was spent around the Disney lot. All classics that we grew up with he was actually there when they were making them as a little kid. So he was able to bring a lot of that tradition in, he has a deep understanding of the musical roots of that studio. JW: The musical intro into the Kaa-Sequence with the music of George Bruns is absolutely stunning! Jon Favreau: Thank you! Also in the very beginning of the movie too, we play sections from the original score, so we really wanted to embrace it. These are the little things and since you are such a fan, at the end you noticed the book that closes? JW: Yes I have seen that, what a wonderful idea! Jon Favreau: It is the same book! We found it in the Archives! And I had to ask over and over again at Disney´s ! They said: you can´t handle the book. You know, this is like a museum piece! 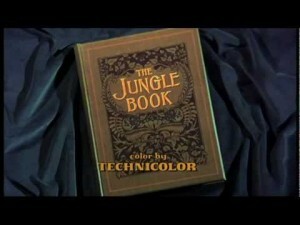 And we got them to bring in the Archivist wearing white gloves and, of course we could have done the book digitally but when the book closes at the end of the movie it is the same exact book that opens up in the beginning of the first Jungle Book! So to me it felt like they never closed the book on their movie. The movie ends without the book. And our film ends with our book closing so it felt like for people that are fans of the original and of course it turns digital when it opens up again in the credits! And we do all the fun stuff with it! I really love being there at Disney and have access to this stuff. By the way, the opening logo with the castle? That is actually is a hand-painted multi-plane cel animation like they did in the old days. So it is like we start with a practical effect and we end with a practical effect. And everything else is just digital except for the boy! JW: Of course we have to speak about Rob Legato and all the hundreds of artists and animators who did all this wonderful stuff. Jon Favreau: Yes I wanted to work with Rob for a long time! He has done it all! I love what he did with HUGO also,it was so wonderful. And another thing about Rob is, when he does designs for 3D, it does not feel like you are just being charged to pay more money to go to see the same movie. It feels like the 3D experience is actually an added value and that was the same I felt with AVATAR and have not felt that many times since I have seen Avatar. I felt that same with Hugo too. Because in designing the shoots and the movement, he really understands that, he has a cameraman´s mind even so he is a vfx genius. 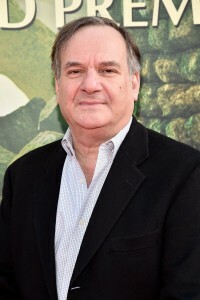 But also credits has to go to all the people who worked under him and with him from the facilities: MPC , the London facility, they did tremendous work, Adam Valdez is the supervisor from there, WETA did the whole King Louie Sequence and it is the animators who are adding all the performance! Even so we used motion capture and video reference: these movies are handmade films. Even a motion capture movie you hear of so much about, there are hundreds of artists whose jobs it is to make that captured data and that animation look like it is real and they are breathing their own humanity and their touch into it. And that is what it brings it to life! And this was something I did not understand completely when I started this. I worked on VFX movies before but never so close with the artists. I was assuming that the computers were doing a lot of the work but really the computer is just a tool! Just as the paintbrush was back then when they were doing cel animation. It is really the level of taste and the craftsmanship and the artistry of these people who are working behind the scenes and bringing all this to life. You know, if you sit through all the songs in the end credits, there are more than 2000 names there. It has never been a more human medium as it is now. Don´t let the technology fool you! JW: So what kind of movie is it? It is not a live action movie and also it is not really an animated movie, or is it? Jon Favreau: It would qualify for either! You know, every shot is animated. So there is as much animation in this film like it is in every other animated film. I think the aesthetics though shifts so, because you have a live action character in the centre of it and so it appears to be live action if we are doing our job right. And as a result, I think, most people would consider it live action! But honestly the line is blurring so much between the two, especially with a film like this, you can call it either one. JW: It is amazing how Neel Sethi is selling this aspect to me while watching him interact with the animals. Jon Favreau: The kid is doing a great job acting. But also there is this level of interactivity that you have not seen before. There are shoots, most people won´t notice: Mogli is running his fingers through the fur of the wolf, that is extremely difficult to do! And the first thing I will try to do,you know, I want to talk you out of the shot when I see the storyboard. And you say: No we are gonna try it!!! So we picked a half dozens of moments where there is direct contact between digital and practical elements and those are generally those you shy away from! Even a film like avatar does not really show that and we are either directly interacting or having a real character and a digital character share a frame which is a much higher standard than in a completely animated film. JW: So it seems nothing is impossible anymore? Jon Favreau: I would not go that far! I think that there is … I think that I have done well with Visual Effects because I have not asked more of it then it is capable of. But I would not mess with a human face yet. That is the one thing where we are just too good in reading a human face. It will happen soon. But I would not trust it yet. JW: But storytelling is open for new frontiers? Jon Favreau: Oh year. Oh year. Well, look: Gravity made me think I could do this! You know what I mean? It could not be more different as far as what the setting is, but your imagination begins to open up! And that is the way cinema has been developing for a century . You have a filmmaker who has an idea of a story they want to tell and then people are working with him and figure out together what piece of equipment to develop, what kind of techniques to developed to tell that story. And then the next filmmaker sees that technique and that inspires them to tell a different story and then they wanna do something that nobody knows how to do and they invent a new way to do that! And that conversation back and forth between the creative and the technical that build upon one another and open up all these new horizons. I could not have done this without the innovations that Jim Cameron had done on Avatar. In some cases we used the equipment he build And James Cameron came by the set and he really welcomed it, that we are using it. People have not used it that much since Avatar and it is a good system – so there is a very supportive community where people are happy to share their techniques with the next generation or another filmmaker and that is why I think that it builds and builds and builds, but you are absolutely right, it is time to reavaluate, looking back and again I think, it is always best when you look at the old stories when you look at the old time artists, the myths and what stories can you present in a new way. What do we have available. And I think the big one is the audience. ..
Jon Favreau: Yes, exactly. Joseph Campbell is who Lucas would reference to and I learned about him through that and it has become my playbook. You know, this story – that was another aspect here! We talked about, how we deviated from the ´67 movie. Part of how we deviated was how to make it more mythic and find the mythology in the Kipling (book) And Kipling´s mythology dates back even further then the 100 years that he wrote it. It is going back to Romulus and Remus, these are very old myths that crossed many cultures. And I think now, when you are telling a story that has to, you know, circumnavigate the entire globe and every culture has to be able to relate to your story, the myths are a very respectable way to accommodate that market, because every culture relates to the old stories. It is part of who we are as a species. And our connection to nature is something that mythology contends with. That is one of the primary concerns of mythology: it is connecting man to nature. 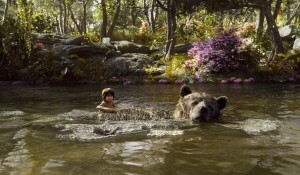 And so Jungle Book lends itself very, very effectively to that and I think Kipling and his writings really reflected that as well and I think that is part of the upside of taking liberties with the ´67 version is making it harkening back to something that is enduring. 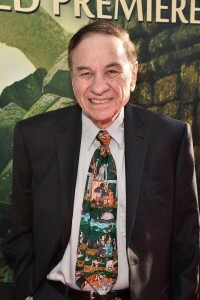 And certainly Disney understood the benefit of taking old stories, he would take old stories, old folklore, old fairy tales from different cultures and then used cutting edge technologies of his days to tell those stories in a way that were incredibly compelling, that is why it stands the test of time. The artistry and technology combined with the old myths is something that seems to connect with people in a very, very deep way!